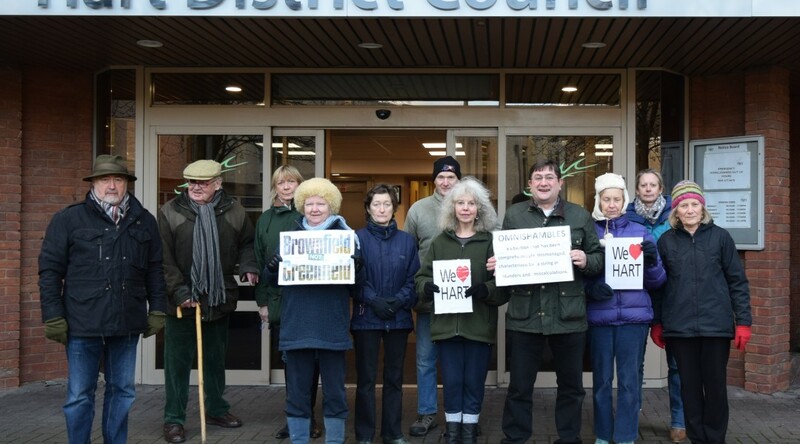 Winchfield Parish Council (WPC) have submitted their response and covering letter (see downloads below) to Hart Council’s Local Plan consultation and effectively demolished all of the arguments supporting Hart’s new town idea. The response was pulled together with the help of professional planners at John Boyd Planning Associates. The lack of evidence is demonstrated by the fact that Hart has not yet consulted upon the issues recommended by Peter Village QC namely, employment, retail, transport, and infrastructure. Moreover, it is premature and illogical to be conducting the consultation now when the Strategic Housing Market Assessment (SHMA) is being revised and we don’t know what the Objectively Assessed Need is going to be. They also note the work done by Alan Wenban-Smith that seriously challenged the numbers in the existing SHMA. 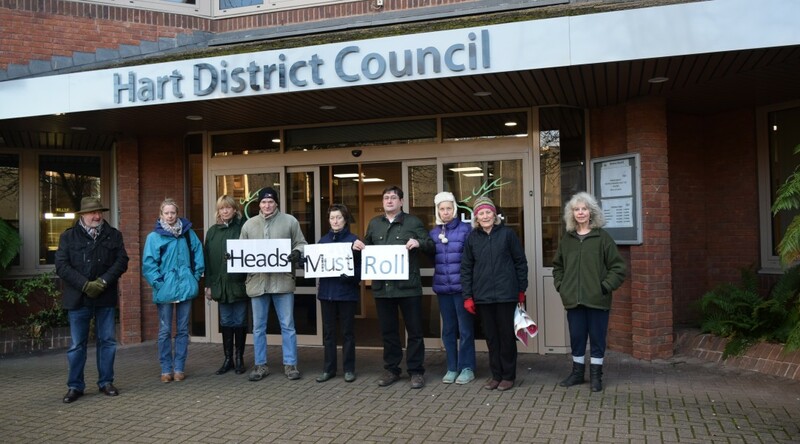 The challenge to the suitability of Winchfield as a location is demonstrated by the significant barriers to delivery outlined by Hart themselves such as education, transport and foul water drainage. They also point out that the main argument used in favour of a settlement at Winchfield, the presence of a railway station, is undermined by the suggestion that the station would have to be relocated to support the new town. There are also significant doubts about the capacity of the available sites to accommodate a new settlement of sufficient size to be viable, especially when one considers the environmental constraints such as SSSIs and SINCs as well as the space that will have to be found for SANGs, shops, car-parks, schools and recreational facilities. Not only that, but the disparate nature of the sites will make it very difficult to plan a coherent and compact nuclear settlement. WPC also challenge the viability of a new settlement by pointing out the massive costs of infrastructure with no evidence being presented to indicate how these costs would be met. The NPPF (para 47 & 173) calls for housing and infrastructure to be planned together, so if it cannot be demonstrated that the right infrastructure can be funded and built, then the whole new town idea could be rejected by an inspector and the Local Plan found unsound. boost investment in infrastructure and regeneration in the locations where it is needed most and help close the £78m funding gap. Finally, they say that it would be inappropriate to try and meet the housing needs of our ageing population through a new town option. All in all, this is an eloquent and devastating attack on the whole idea of a new town and is very much in-line with what We Heart Hart has been saying for months. We can only hope that the councillors will take heed of such an important report from professional planning consultants and get the Local Plan back on track to being found sound at inspection. It has emerged that Hart Council have no effective way of monitoring how many dwellings of different types that have been built or permitted as part of the Local Plan. They have admitted that essentially they are flying blind and do not know how many 1 & 2-bed properties have been built or permitted and similarly do not know how many specialist units for the elderly are in the pipeline. This is despite the fact that the Strategic Housing Market Assessment (SHMA) is very clear on how many homes of different types have to be built as part of the overall 7,534 requirement. We asked questions at Council about this on 28 January and received short shrift, with the chairman refusing to allow the question about 1 & 2-bed homes to be put, and the question about accommodation for the elderly was not answered. 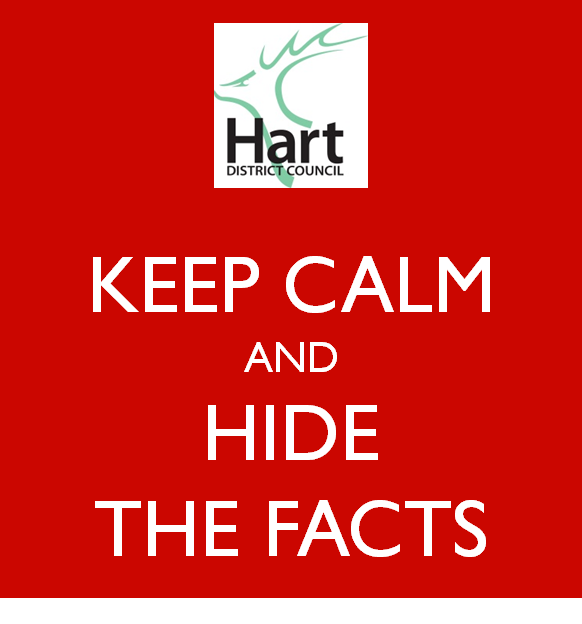 We followed up with FOI requests on both questions and have been told that the the information was available on Hart’s Planning portal. It transpires that what they mean by this is that they expect members of the public to wade through hundreds of planning applications and hundreds of building control records to manually collate and report on the data, and even then, not all of the data required to answer the questions is available. 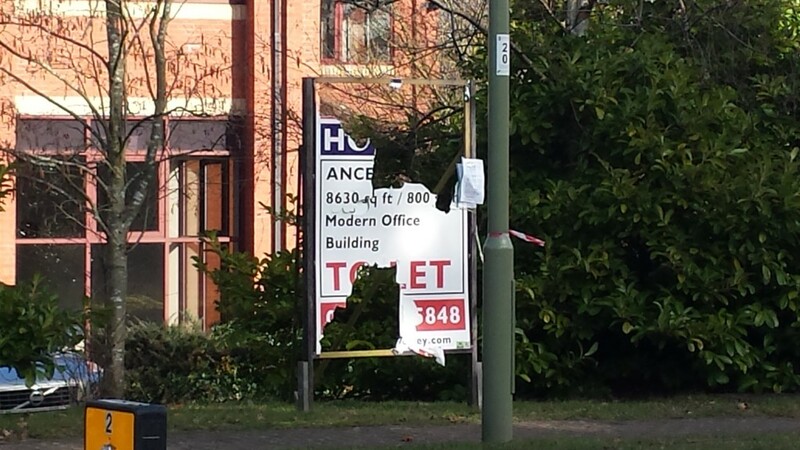 At first, we thought this was just obfuscation on the part of the council, but subsequent discussions with officers has revealed that Hart Officers would have to do exactly the same work to get at the answers. What is particularly astonishing is that none of the councillors appear to have any interest at all in this and appear to be content to allow the council to fly blind. We don’t think this approach will stand up to scrutiny by an inspector, because the SHMA is very clear on the different types of housing that needs to be built. To re-cap, according to the current Strategic Housing Market Assessment (SHMA), Hart needs to build 7,534 dwellings in the plan period running from 2011-2032. The SHMA is also very clear on the sizes and types of housing that needs to be built, including the number of affordable homes for the young and specialist housing for the elderly. First, the quantity of houses that needs to be built by the number of bedrooms is covered in Figure 9.8, reproduced above. Working through the arithmetic reveals that we need to build around 3,800 1 & 2-bed dwellings, using Hart’s target of 40% affordable. Hart has built or permitted around 4,600 dwellings since 2011 and has no idea what the split is by number of bedrooms, and so has no idea how many more smaller, starter properties need to be built out of the remaining 2,934 to be permitted. 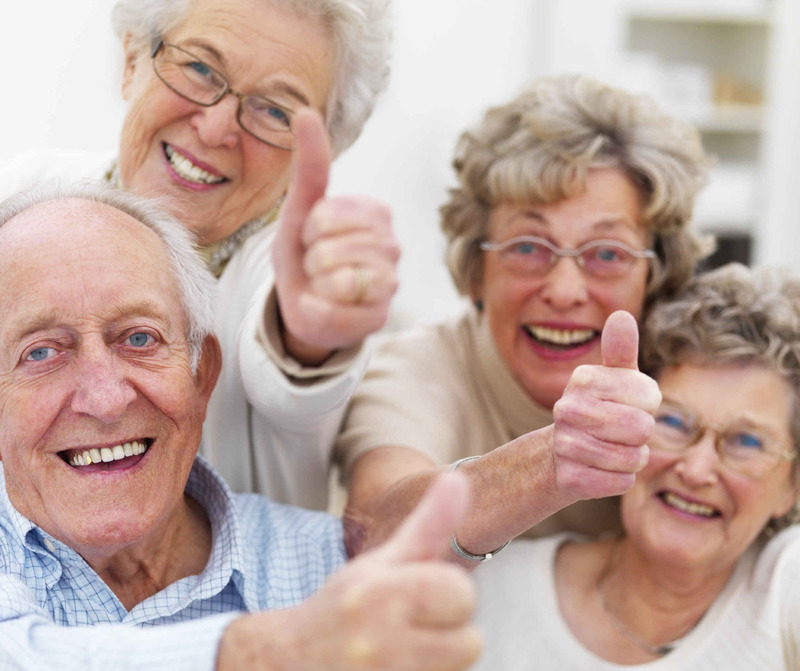 Second, the number of specialist units for the elderly is covered in Figure 10.15. Between 2012 and 2030, Hart needs to provide 1,390 specialist units for the elderly and infirm. Extending this back to 2011, and out to 2032 at the 80 dwellings per annum rate identified in the report would give 1,650 units. To this must be added the further 940 registered care places in the graphic above. This gives a total of 2,590 additional units for the ageing population. Hart has built or permitted around 4,600 dwellings since 2011 and has no idea how many specialist units for the elderly are in that 4,600. Consequently, Hart has no idea how many more of these specialist units need to be built out of the remaining 2,934 to be permitted. Surely we cannot continue to go on with basic management tools missing from the Local Plan process and seemingly none of the councillors being at all concerned. We live in hope that soon the council will be able to provide data on what has been built since 2011, but there doesn’t appear to be an easy way to get at the data for what has been permitted for the future. 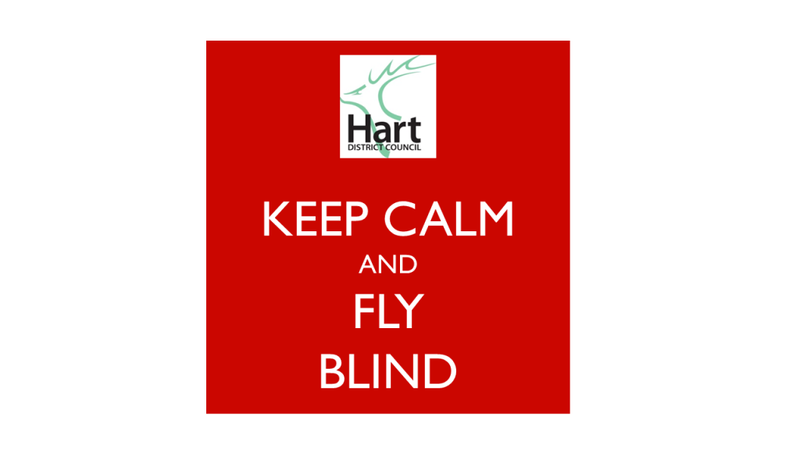 If you would like to ask Hart to get a grip on the situation, and create a brownfield solution to meet the housing needs of the young and elderly in Hart, we urge you to respond to the Hart District Council consultation about the Local Plan and ask them to think again. We have created a dedicated consultation page, updated our two guides to responding to the consultation and they are available on the downloads below. The comments are designed to be cut and pasted into the boxes provided. It will be very powerful if you could edit the comments into your own words. Please do find time to respond to the consultation and play your part in saving our countryside. 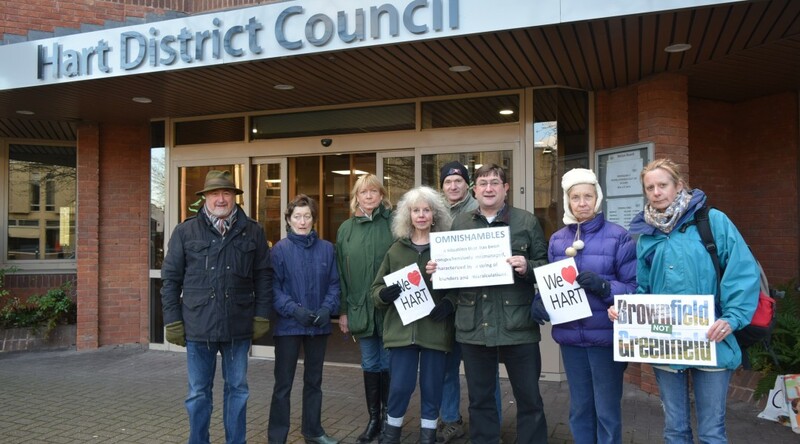 Some of the opponents of the proposed Watery Lane development in Church Crookham have criticised We Heart Hart for not joining them in opposing building a housing estate there. We cannot get involved in each and every planning application, but the material below outlines what we believe would be useful material for Face IT and other groups to use as they see fit to add to their case. As a result of the over-stated need in the SHMA, the current land supply statement understates the land-supply position, therefore the Watery Lane development is not needed now. A development such as Watery Lane would build the wrong type of housing in the wrong place to meet the needs of the district. Hart’s policy is to build 40% affordable and 60% market housing, or a split of about 3,014 affordable and 4,520 market to meet our overall need of 7,534. The SHMA (Figure 9.8) calls for 40.8% 1-bed and 33.2% 2-bed properties from our affordable housing target and 6.7% 1-bed and 28% 2-bed properties from our market housing target. This gives a total target of 1,532 1-bed and 2,266 2-bed properties. No data has yet been forthcoming on how well or badly we are doing against these targets, but perhaps Face IT could join We Heart Hart in asking Hart to produce the information to allow us to know one way or the other. More traditional housing estates in the countryside are likely to under-deliver on both affordable and smaller properties. Similarly, the SHMA (Figure 10.15) calls for around 2,500 specialist units for the elderly, split into various categories to be built in Hart under the Local Plan. We do not know how many have been built or permitted to date, but again it is self-evident that a housing estate in the country would not deliver specialist units for the elderly. Again, perhaps Face IT can join We Heart Hart in requesting that this information is released. We do hope that the team opposing Watery Lane find this information helpful. Openness: openness is required to ensure stakeholders can have confidence in the decision making and management processes of the Council. Inclusiveness: an inclusive approach ensures that all stakeholders and have the opportunity to engage effectively in the decision-making processes and actions of the Council. Integrity: is based upon honesty, selflessness and objectivity, and high standards of propriety and probity in the stewardship of public funds and management of the Council’s affairs. Question 1: Given that a) in October 2013, you were quoted as saying we would submit a new version of the Local Plan to the Inspector in Autumn 2014 and b) in each subsequent year this has slipped by a further year, with the current LDS indicating a local plan ready for submission in Winter 2016, will you now publish the detailed project plan to support this target, so we can be assured that project management processes have improved? Blah…blah..blah…The Local Development Scheme is the council’s three-year project plan that identifies which local development documents will be produced, in what order, and when. We do not propose to publish more background information on internal workings because that offers no practical advantage to anyone. There is already proper scrutiny of the Local Plan progress with all members of the Council having the opportunity to be actively engaged. We also last summer enlisted the support of Chris Dorn to lend project management support. His work has been invaluable and he gave positive and independent feedback to the Hart District Association of Parish and Town Councils. Finally, we have now full project management arrangements from our neighbours at East Hampshire District Council, who have recent and relevant experience of bringing a local plan through Examination to adoption. What they really meant: Here’s some blather and vague implausible excuses why we haven’t been able to publish a Local Plan when 82% of Local Councils have managed to do it. There’s no way that we are going to publish the project plan, because we don’t want to be held accountable for any future slippage. Question 2: Given that in January 2015, HDC commissioned work to test the proposed new settlement and urban extensions with the objectives to test the “deliverability of a new settlement and/or urban extension (ie [sic] suitability, availability and achievability)”, including a land use budget; provide “indicative costing of the major infrastructure items needed”; and consider viability including the “infrastructure requirements of sites to identify likely infrastructure impacts, subsequent costs and potential funding sources”, can you explain if these objectives have been met, and say when the results will be published? “The testing we decided to undertake is still ongoing as is the testing of all other options. The testing will go on in some form or other right up until we finalise the submission Local Plan. There is still much work to be done, but we have reached a point where we can now ask you if we are on the right track”. We then go on to summarise on pages 9 and 10 what outcomes have been received from the testing that we have carried out so far. The outcome of the testing will therefore, inform both the draft Local Plan and will inform the submitted Local Plan in that it will comprise part of the evidence base. All these documents will be published at the appropriate time and everyone will have the right to comment upon them when the Local Plan is independently examined by an Inspector appropriated by the Secretary of State. What they really meant: No, we haven’t met the objectives. If we actually finished the testing, it would likely show that a new town in Winchfield is not viable and we wouldn’t want to be transparent about that would we? Supplementary Question: All of the sites identified to make up the new town and urban extensions are listed in the SHLAA as “Not currently developable”, we have no costing of roads, bridges, railway improvements, sewage, sports or community facilities and we have no land use budget that includes SANG, so why are you consulting on a new town that is not deliverable, as well as excluding brownfield sites for the same reason? What they really meant: How dare you ask me for facts? Of course, we will change our policies to get a new town at all costs, just like we changed the questions in the consultation. Question 3: Given that an FOI request to elicit the evidence to support the assertion made at cabinet (Paper E 5.2) in September 2015, and in Hart news (p2), that brownfield capacity for the district was 1,800 units has failed, are we to conclude that the council and public were misled in September, or will you now produce the evidence and ensure that any new consultation includes a proper stand-alone option for brownfield sites? Answer: Nobody was misled by this council. The FOI request did not fail. What they really meant: Of course, it was a mistake to publish the real brownfield capacity, but we’re not going to publish how we arrived at the figure. We are doing our best to erase that from history and push on for a new town. Question 4: You will recall that I wrote to you on 20 November 2015, highlighting discrepancies between the consultation materials and SHLAA, the most important point being point 4 (and appendix) showing the very different site capacities in the New Homes Booklet compared to the official evidence base, the SHLAA; can you now give an explanation of those discrepancies and will they be corrected before any new consultation is carried out? an explanation about the differences between the SHLAA and the New Homes Sites Booklet regarding site capacities (email from the Planning Policy Manager sent on 23rd December 2015). The plan is to publish an updated SHLAA in the summer of 2016 to reflect the best information available at that time including data on annual completions which becomes available around June each year. [Note: I did point out that I had written back to them on 12 January making clear that Point 4, amongst others, had not been answered]. What they really meant: We deliberately make it all very confusing, and who cares if the material we send out to the electorate doesn’t match the official evidence we spent loads of your money to produce and published at the same time as the consultation. Question 5: Given that the SHMA (section 9.33) calls for 60-70% of our 7,534 housing need (or around 4,900) to be met from 1 & 2-bed properties, can you give a breakdown by number of bedrooms, of the 4,500 or so dwellings built or permitted since 2011 and tell us how many more 1 & 2 bed homes need to be built out of the remaining ~3,000 to be permitted to meet the need expressed in the SHMA? [Note: is has subsequently emerged that the preamble to this question did contain a mistake, and the need for 1 & 2-bed properties is ~3,800 units, but that doesn’t take away the need for Hart Council to measure how well it is meeting the need, nor does it stop the question being answered]. Answer by Chairman: This is a technical research question and does not form part of any current Council workstream. This is not the proper forum to be used to elicit the use of Council resources in pursuit of your own personal research. I say this because the information that you seek is already published. You can obtain the information by accessing all the planning application details of applications submitted and determined which is published on the online Public Access system. I would also point out that section 9.33 of the SHMA relates to affordable housing and not general housing mix. It may be you have missed out a few words which fundamentally alters the meaning of your question. [Note: I asked by email immediately after the meeting where this information can be found and have received no response]. What they really meant: You just don’t get it do you? This isn’t about facts or meeting the needs of Hart residents it’s about getting a new town. Of course we’re not going to tell you how well or badly we are meeting the needs of local residents nor information that might suggest that a new town is not the right answer. Where would we be if we were transparent? Question 6: Given that the SHMA (Figure 10.15) calls for around 2,500 specialist units for the elderly, split into various categories to be built in Hart under the Local Plan, can you tell us how many of these units have been built or permitted since 2011, how many remain to be permitted and what you consider to be the best types of location for these types of accommodation? Blah…blah…This approach is exactly in accordance with government policy as set out in Paragraph: 003 Reference ID: 12-003-20140306 of the updated September 2015 National Planning Policy Guidance. What they really meant: Meeting the needs of the elderly is not our priority and you must be joking if you think we are going to publish any information that shows we’re not meeting their needs. We want loads more detached houses in the countryside from a new town and urban extensions. Supplementary: How can the young who need the affordable 1 & 2-bed dwellings and elderly have confidence in the Local Plan process when the leader doesn’t know what we need to build to meet their needs? Answer: This will be dealt with under the FOI request. What they really meant: How many more times do we have to explain, we don’t do facts? This isn’t about meeting the needs of local people. It’s all about getting a new town at all costs. Question 7: What are the risks that a second consultation “anticipated to be run again from late January”, will be a further waste of Hart residents’ money, when the revised SHMA is due “early in 2016” and a revised employment land review is also being prepared, thus meaning that the evidence base is likely to change significantly during the consultation, leading to a further consultation being required? What they really meant: I don’t care about risks and I don’t care about your money, I want a new town. The new SHMA will likely show a big reduction in the housing need so we won’t need to build 3,000 houses for Surrey Heath and Rushmoor and we’ll be able to meet all Hart’s remaining needs from brownfield sites. If that were put to residents they wouldn’t vote for a new town or urban extensions and where would that leave us? Question 8: Who instigated, who authorised and who will take responsibility for each decision to repeatedly change the materials in the recent consultation part way through? Answer by Chairman: I am directing that this question is not to be answered. This is because, as Mr Turver knows, it forms the basis of a separate investigation by Overview and Scrutiny and indeed, Mr Turver has been party to representations made pursuant to that investigation. It would therefore be wholly inappropriate to enter into discussions in public without all the facts surrounding the events that resulted in the early curtailment of the Refined Housing Options consultation having first been investigated by Overview and Scrutiny Committee. [Note: Cllr Bailey did make the point that the O&S work is a review, not an investigation and he did not intend that review to act as block on members of the public asking questions]. What they really meant: How dare you ask us to be open, transparent and accountable for our actions? 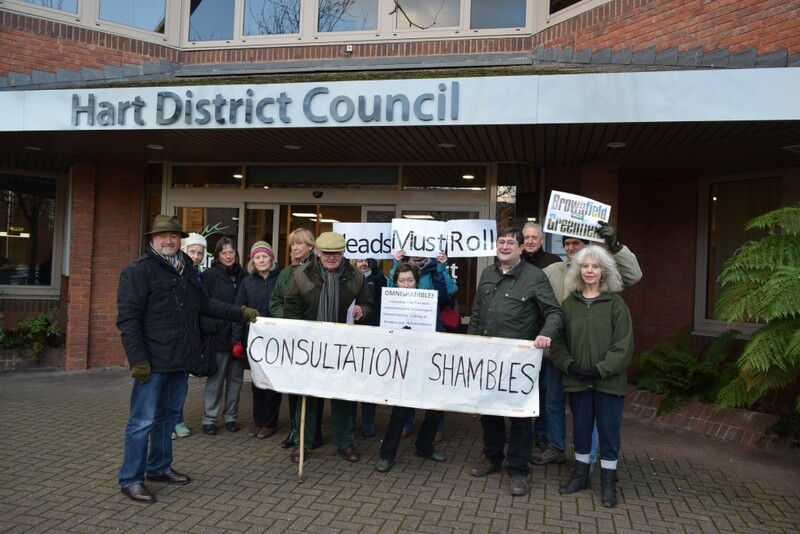 Supplementary: We’ve heard tonight that you have failed with the last consultation, haven’t got a grip on the timeline, project management or the quality and content of the outputs, isn’t it time that you and the rest of the Local Plan Steering Group did the decent thing and resigned? Answer: I do intend to do the decent thing and deliver the local plan. What they really meant: We can’t have someone in charge who might actually look at the evidence and try and meet the real needs of Hart residents can we? 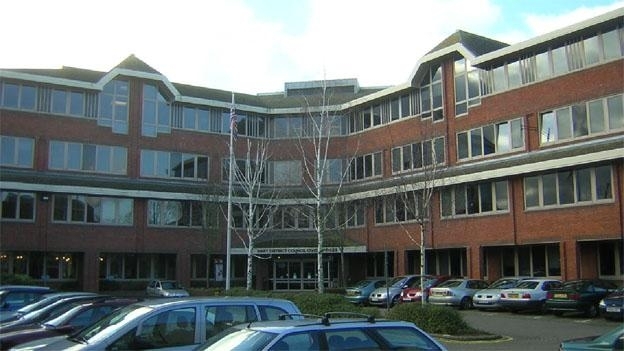 Hart District Council Offices in Fleet, Hampshire. After the Local Plan consultation debacle, we have put a series of questions to Hart Council that will be answered at their meeting on 28 January 2016. Please do come along if you can. The full questions can be found on the download below, and cover whether Hart Council has a project plan we can believe in; the progress (or otherwise) made in testing the Winchfield new town proposals; what happened to the 1,800 dwellings that Hart said in September could be built on brownfield sites; discrepancies between the consultation documents and the official SHLAA; how well we are meeting the needs of the young and elderly; the risks of re-running the consultation now, given the housing target (SHMA) is about to change and of course, seeking clarity on who instigated and authorised the fateful changes to the consultation materials part way through. Protest at Hart Council’s Offices. After a period of reflection, we have now had time to compose a response to Hart’s astonishing decision to abandon the Local Plan consultation and set out what we think should happen to bring the Local Plan back on track. This has been sent to all councillors. Readers may wish to copy a link to this page and send it to their ward councillor and add their own ideas on what should be done. A list of councillor contact details can be found here. What should we think about Hart Council’s decision to call off the Local Plan consultation with only a day to go before it was due to close? Well, to misquote Churchill, this consultation has been a farce in a fiasco inside an omnishambles. Never has so little been achieved by so many with so much of our money. This is but the latest entry in a catalogue of mismanagement and misjudgement. Back in April 2015, Peter Village QC described Hart’s position as “hopeless” and precious little has changed since then. This abandoned consultation has not even covered the areas that he said should have been covered, namely, employment, retail, transport and infrastructure. In April 2014, the plan was to have a resubmission plan ready for consultation in October 2015. In February 2015, the plan was to have a resubmission plan ready for Autumn 2015. As late as April last year, the council was insisting that they were still on track to deliver a Resubmission Plan by Autumn 2015, despite our warnings that the project was slipping. 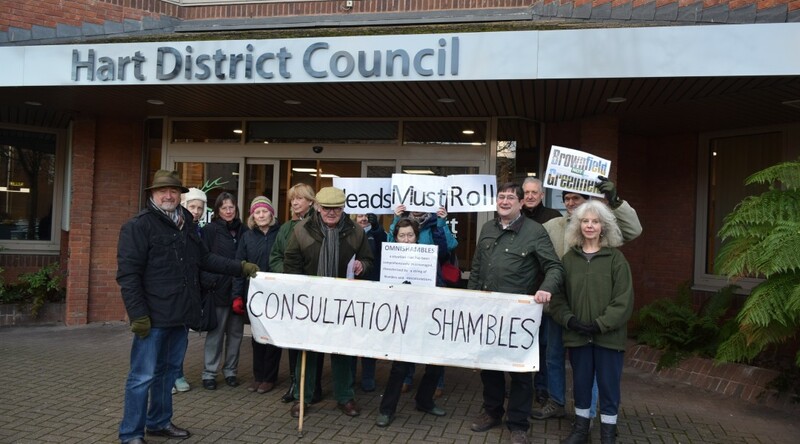 We are now in a position, according to the latest schedule, where the Resubmission plan is due in Autumn 2016, but this has to be in serious doubt given the failure of this consultation and the fact that the evidence base won’t be revised until Spring 2016 and Hart have to hold a Regulation 18 consultation on the draft Local Plan, and heaven knows why it is planned for the Summer, when many people will be on holiday. It is difficult to come to a conclusion other than the project management is woeful. We need also to look at the governance of the project. Power on the Local Plan Steering Group (LPSG) is concentrated in the hands of urban councillors who have presided over this mess. Not only that, the quality of the deliverables to date is poor. By way of example, in January last year Hart commissioned a piece of work to test the new settlement and urban extension options. The published results of this work have not met the objectives set at the outset. I have had many people send me Facebook messages, tweets and emails saying what a farce the process has been a shambles and a waste of time and money. One correspondent has even been moved to write a poem, saying they thought our leader has led us up the garden path and couldn’t even run a bath. In short the council is a laughing stock. Many people have also come to the conclusion, rightly or wrongly, that the reason the consultation has been called off is that the people were giving the ‘wrong answer’. There is no confidence in the council, the credibility of the whole Local Plan process is subterranean, with some complaining of “consultation fatigue”. If the consultation is re-run at the end of January, it is extremely likely that parts of the new evidence base will be released during the consultation, thus meaning that the consultation will be run on the wrong evidence base, invalidating the results. The Local Plan process is so far behind schedule that we are running the risk of Central Government stepping in and doing the Local Plan for us. Moreover, the Government is currently consulting on plans to remove the New Homes Bonus from councils that do not have a Local Plan, so this further failure may result in a hit to services or increases in council tax. So, it is clear we need a good Local Plan and quickly. But before we can move forwards it is imperative that we fix the management and governance failings that have led us to this unhappy place. 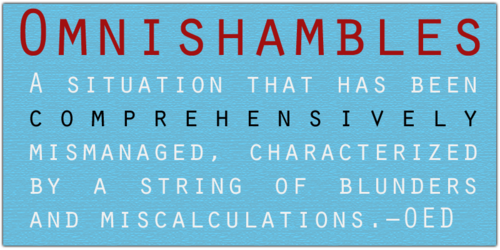 It is simply untenable for the current incumbents to carry on as if nothing has happened. Resignation of the entire LPSG from their positions to be replaced by a new group of senior councillors from a balance of rural and urban wards. I’m sorry to say it, but the cabinet member for planning and leader’s position is untenable after presiding over such a comedy of errors. Whoever authorised the change to the questions mid-way through the consultation within the “officer” side must at least be severely reprimanded. Only when the revised evidence base (SHMA and Employment Land Review) has been published, should Hart run a new Regulation 18 consultation covering employment, retail, transport, infrastructure as well as housing distribution as per the advice from Peter Village QC. The consultation should be put together and run by a competent third party organisation. A standalone brownfield approach, covering all current brownfield sites in the SHLAA, the Stonegate Report and any new zones of opportunity identified in the call for sites should be added to the consultation as per the request of the 2,130 signatories of the WHH petition. It is simply not credible to set a “deliverable” criterion for brownfield sites when almost all of the green field sites subject to consultation were “not currently developable”. The council can’t have it one way for brownfield and another for greenfield sites. Many brownfield sites in the SHLAA/New Homes Booklet were “rejected” for apparently arbitrary reasons, they certainly did not appear to have more onerous constraints on them compared to those selected for consultation in Q6. The differences between the site capacities shown in the New Homes Booklet compared to those in the official evidence base in the SHLAA (see point 4 in this letter to councillors, dated 20 November 2015 and Appendix) need to be rectified. The process of the consultation needs to be simplified and improved, with the weighting system being resolved and published before the consultation starts. The risks of a new town and urban extensions should be properly laid out (including creating capacity to take 3,000 houses from Rushmoor and Surrey Heath and the infrastructure costs). All of the SHLAA sites should be offered for consultation in Q6, and the ranking approach changed to something more objective and able to be analysed across parishes such as “strongly oppose, oppose, support, strongly support”. It should be possible to pass comment without ranking sites that you don’t agree should be developed. It was particularly odd to see that the NHB rejected sites that had appeared in Neighbourhood plans. You might do well to review my suggested 5-point plan that I tried to put to council in the Summer, but my question was censored. The different infrastructure contribution regimes for different styles of development should be properly explained: a certain cabinet member was spreading misleading information about this during the recent consultation. My understanding is that only office conversions attract no S106/CIL whereas brownfield redevelopment is subject to the same contribution regime as green field development. It should also be explained that new homes in vacant office blocks attract council tax (and new homes bonus), which HDC retains, rather than business rates much of which is surrendered to the Government. There also needs to be more robust processes for verifying the identity of all those participating in the consultation, and proper rules set on who can and cannot comment: theoretically the consultation just abandoned could have been answered by babes in arms in Aberdeen which is clearly ridiculous. Only root and branch change of process and personnel will restore confidence and give enough credibility to create a sporting chance of getting a good Local Plan on time. Press release is available for download below, together with a carousel of pictures of our shot demo outside Hart Offices. 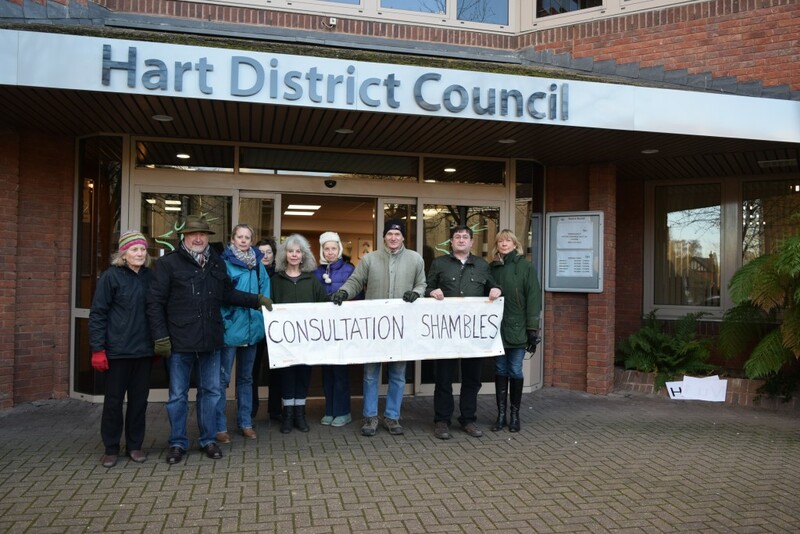 Protest at Hart Council's Offices about the consultation shambles. 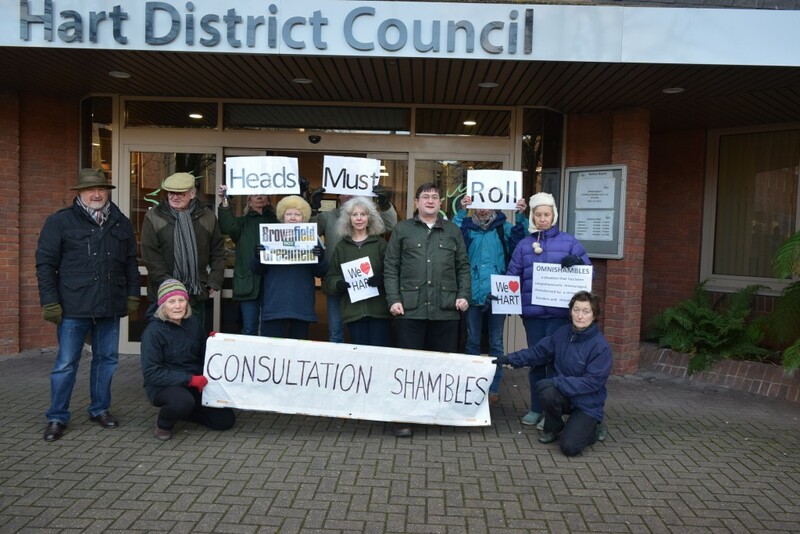 Protest at Hart Council's Offices about the omnishambles Consultation. 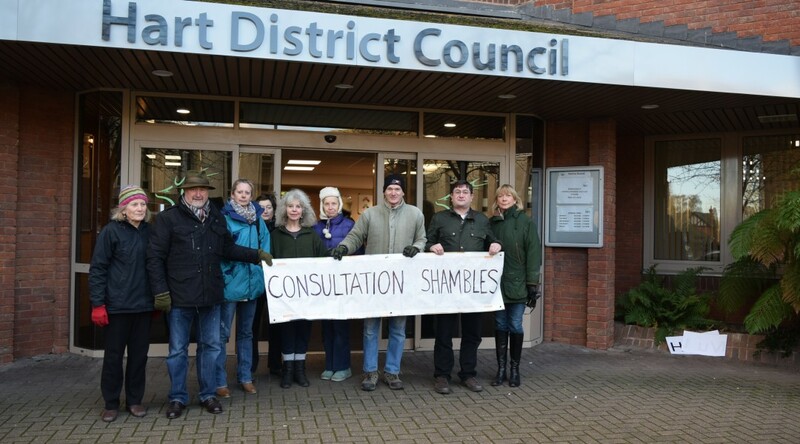 Protest at Hart Council’s Offices about the consultation shambles. 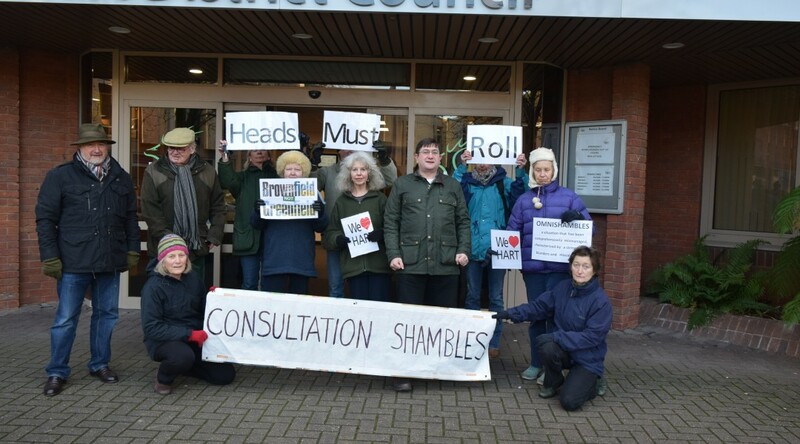 Protest at Hart Council’s Offices about the omnishambles Consultation. Fleet Town Council have distributed a leaflet that, in our view, seeks to mislead the public. 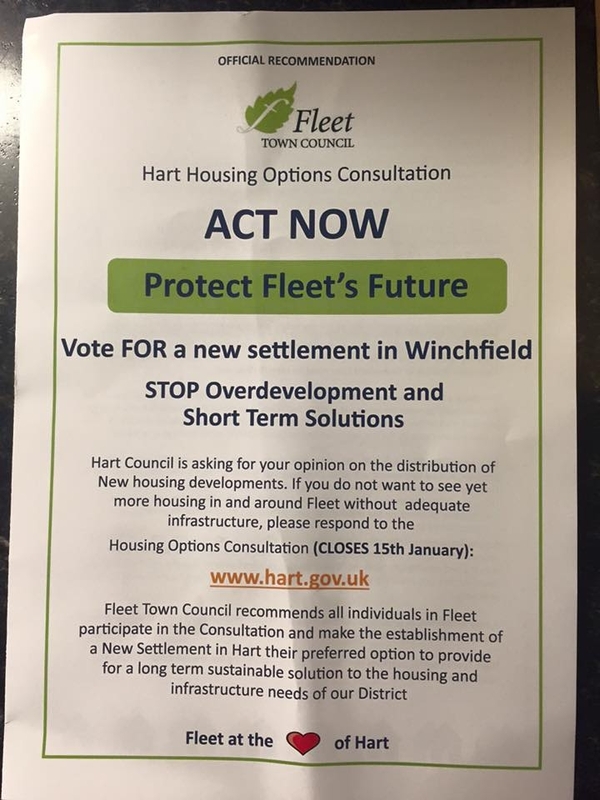 The leaflet suggests that a new settlement in Hart would be a “long term sustainable solution to the housing and infrastructure needs” of the district as an “official recommendation”. Concreting over the equivalent of 25 football pitches a year is not in any way sustainable, and this approach would lead to another new town being required every 10-15 years and destroy the green spaces that make Hart such a great place to live. A new town will require over £300m of infrastructure funding, with only £50m of developer contributions, and of course will do nothing to address the £78m infrastructure funding deficit across the district. Surely, it would be much better to follow Ranil’s advice and redevelop our ageing and vacant office blocks in a brownfield solution that will meet the needs of Hart residents as opposed to those wishing to move here from London and deliver infrastructure funding for our existing communities. Of course, Fleet Town Council offer no evidence at all to support their assertions. We are of course flattered that they have chosen to make their leaflet in the style of the leaflet we distributed at the end of last year. If you would like to make your voice heard and object to the new town idea, we urge you to respond to the Hart District Council consultation about the Local Plan and ask them to think again. We have created a dedicated consultation page and two guides to responding to the consultation that are available on the downloads below. The comments are designed to be cut and pasted into the boxes provided. It will be very powerful if you could edit the comments into your own words. Please do find time to respond to the consultation and play your part in saving our countryside. 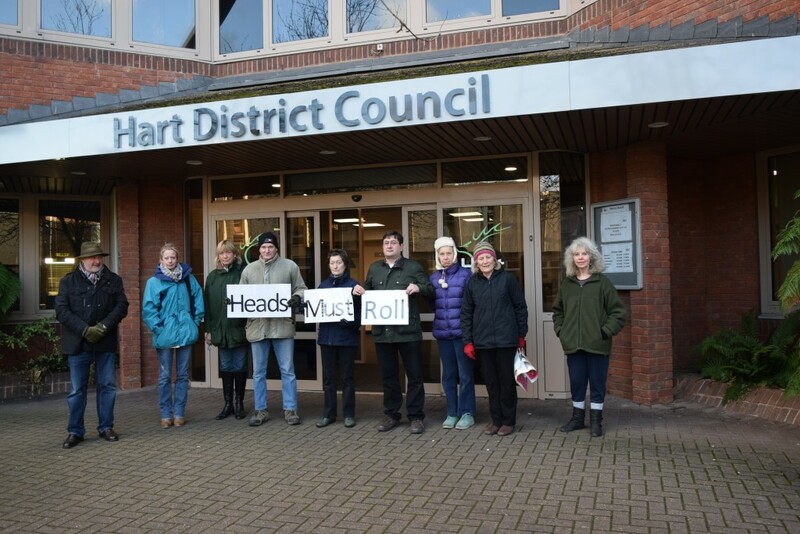 As we posted earlier, we have submitted the We ♥ Hart petition with 2,130 responses to Hart District Council and the council have set out the process by which they will consider the petition. We have drafted some suggestions as to how the council should respond and sent them to Council leader, Stephen Parker. We have a chance to put these ideas to Cabinet on 1 October at 7pm. Please tell us if you are coming along to give us your support and please e-mail your councillors to ask them to support these proposals and incorporate them into the forthcoming consultation about the Local Plan. The full set of suggestions can be found here. This suggestion relates to properly considering the needs of the ageing population. We set out in a question to council earlier this year that Hart will need to deliver around 2,500 housing units to meet the needs of the ageing population. We contend that a new town will simply build the wrong type of accommodation in the wrong place to meet those needs. It would be far better if these were built on brownfield sites in more urban areas, close to amenities such as doctors, post offices, shops and so on. When the elderly move into these types of development, their well-being improves and of course, they free up conventional housing stock for families. Could we therefore ask that the forthcoming consultation paper contains specific proposals on how the needs of the ageing population will be met? 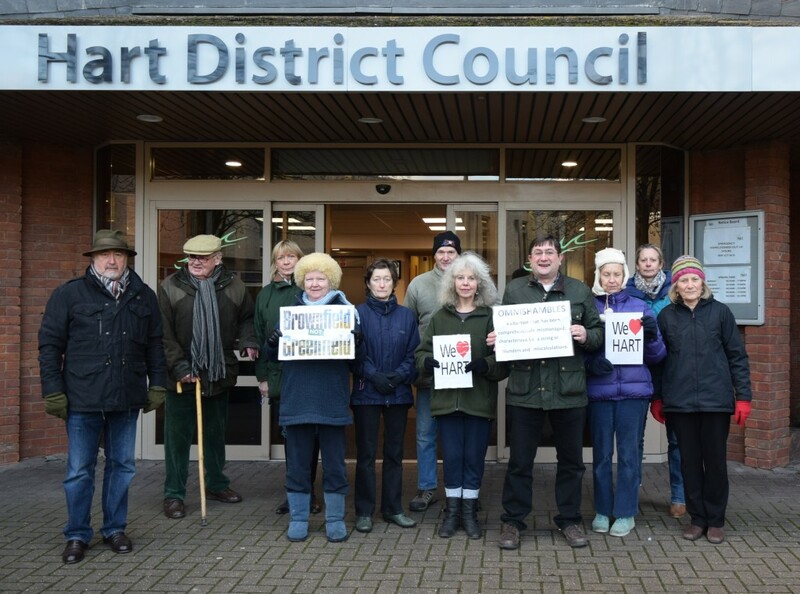 As we posted earlier, we have submitted the We ♥ Hart petition to Hart District Council and the council have set out the process by which they will consider the petition. We have drafted some suggestions as to how the council should respond and sent them to Council leader, Stephen Parker and they are shown below. We have a chance to put these ideas to Cabinet on 1 October at 7pm. Please tell us if you are coming along to give us your support. Please e-mail your councillors to ask them to support these proposals. As you know the petition is from 2,130 signatories, nearly four times the number that responded to Hart Council’s consultation last year and more than ten times the number of people who expressed a first preference for a new town and is therefore a very significant expression of local opinion. I welcome your approach to treat the petition seriously. My understanding is that a petition of over 1,000 signatories would trigger an automatic debate at full council. However, I do believe a debate at Cabinet is more likely to be more productive, so I support the approach you suggest. I think there are two broad approaches to this. First, challenge the SHMA to reduce the overall housing allocation for the whole HMA. If this is successful, then it will have a two-fold effect of reducing Hart’s own need and also reducing the risk of overflow from Surrey Heath and Rushmoor. I believe the key arguments are around inward migration assumptions; average household size and in particular jobs growth assumptions which are at a rate nearly double what was achieved over the economic cycle from 1998-2012 and will result in unprecedented levels of participation in the labour market (rising from around 70% to around 86%) for those of employment age. I gave more detail on these arguments at both the Hop Garden Road appeal and in my response to the Rushmoor Local Plan. More detail can be found here. However, I do recognise it is difficult for the council to challenge its own document and I await Rushmoor’s response to my strong challenge, but I do understand that the SHMA may be re-visited and it would be helpful if the council would commit to challenging the assumptions set out above as part of that process. Second, in conversation with a number of professionals in the planning sector, I have been told a number of times, that it is uncommon for councils to explore fully their “policy on” options with regard to environmental and other constraints. 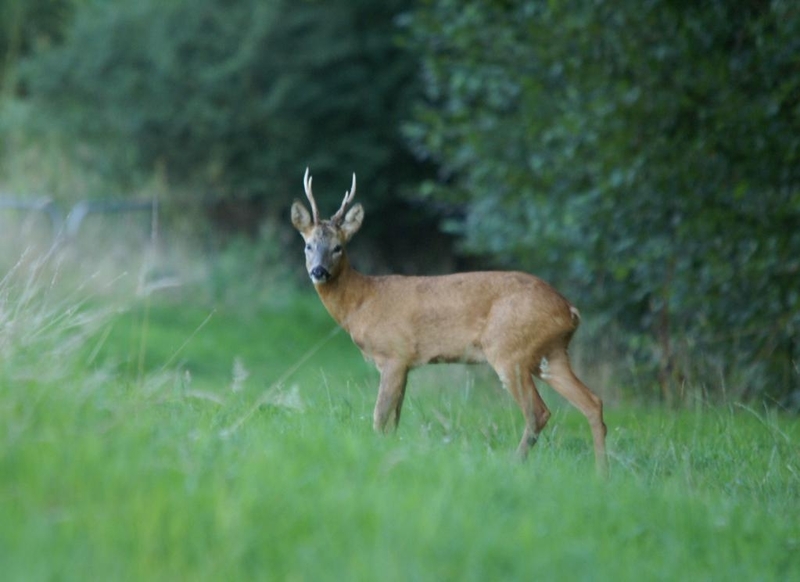 One of the main attractions of Hart as a district is its rural environment with associated SPA, SSSI’s, SINCs, green space and wildlife. May I suggest that a proper environmental study is carried out to set out the value of Hart’s environment and ecology to build an argument for not meeting the full requirement of the SHMA? I know that WAG is working on some proposals in this area with some of the rural parishes and would be keen to discuss the matter with you and offer to share the costs of preparation. 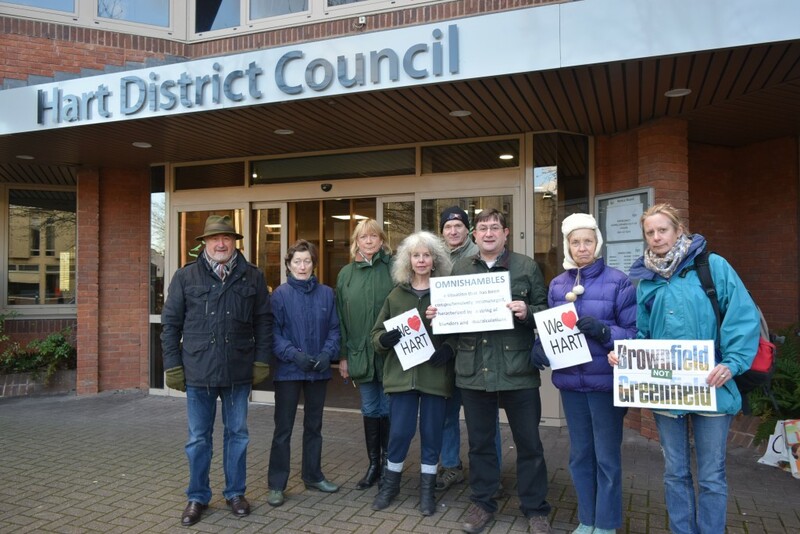 Demand that the Council develops a vision and strategy for Hart that retains its role as a rural, green hinterland for NE Hampshire that respects the separate character and identity of Hart’s settlements and landscapes and preserves the green spaces as amenity space for the urban settlements. You may recognise the words above as taken from the withdrawn 2013 Core Strategy. This was, and remains a good vision. I would ask that as a minimum, the forthcoming Regulation 18 consultation sets out at least one potential “vision” for the district, and that one of the “vision” options includes words to this effect. All of the dwellings above were not included as brownfield sites in the SHLAA. Guillemont Park (Sun Park) was in the SHLAA but for a lower number of units, and in Part 2, which was not considered to include brownfield locations. Since last November revised permission has been granted at Landata House for 28 more dwellings than were included in the 5 year land supply calculation. If the original 750 units were to be added to the 1,688 units identified above, then that amounts to a total of 2,438 potential units on brownfield. If it were possible to increase the density (from 30dph to a still reasonable 80dph in urban areas) on the original 750 units, the total identified capacity would rise to some 3,688 units. The remaining requirement of 4,000 has of course been reduced by the unfortunate decisions to allow development at Watery Lane (300 units) and Hawley Park Farm (126 units) leaving the remaining allocation at 3,574. It is clear that with some creativity and energy, the gap between the remaining allocation of 3,574 and the currently identified brownfield capacity can be closed by working on a combination of reducing the overall allocation by reducing the SHMA or applying environmental “policy on” considerations, increasing density and finding more brownfield sites. In the light of this, I welcome the paper that is to be put before Cabinet next week, signalling the more positive approach that the council proposes towards building housing on previously developed land. Creating a new, formal “reasonable suitable alternative” option of meeting the remaining housing allocation solely through brownfield development. This option should appear in the consultation paper. Creating a complete database of all of the potential brownfield sites in the district, including those not in the October 2014 SHLAA and those not yet formally promoted to the council, including sites such as Bramshill House, Pyestock (aka Hartland Park), Sun Park, Ancells Farm, Bartley Wood, Fleet High St, Fleet Police Station and all of the run down town centres (e.g. Fleet, Yateley, Blackwater and Hook). Inviting leading architects to compete to produce some visionary outline schemes of what a “brownfield solution” might look like for the district, taking into account changing demographics, changing shopping habits driven by the internet and achievable housing densities. Organising a conference with the architects, land owners, developers and local community representatives with the objective of identifying the art of the possible for brownfield development amongst the competing solutions from the architects. This could be done in conjunction with the neighbouring authorities of Surrey Heath and Rushmoor, particularly given the massive amount of current and forecast vacant employment land and Rushmoor seeking to protect 96 Ha. To request that future housing stock reflects the needs of the changing demographics of the district. I set out in a question to council earlier this year that Hart will need to deliver around 2,500 housing units to meet the needs of the ageing population. I contend that a new town will simply build the wrong type of accommodation in the wrong place to meet those needs. It would be far better if these were built on brownfield sites in more urban areas, close to amenities such as doctors, post offices, shops and so on. When the elderly move into these types of development, their well-being improves and of course, they free up conventional housing stock for families. Could I therefore ask that the forthcoming consultation paper contains specific proposals on how the needs of the ageing population will be met? To demand the council and government do not plan for any new settlement in Hart that will act as a sink for the unmet housing need in neighbouring areas. Government has called on planners to recognise the intrinsic value of the countryside. Eye-watering costs of infrastructure for a new town, especially considering the current £78m funding deficit in Hart and £1.9bn funding deficit across Hampshire. I do hope you find these suggestions helpful. I would be grateful if you could circulate them to planning officers and Cabinet members for their consideration.